The 9130 is a fully programmable triple output DC Power Supply delivering 0-30V/0-3A on 2 outputs and 0-5V/0-3A on 1 output. Each output is fully floating and outputs can be adjusted independently or connected in series or parallel to produce higher voltages or currents. 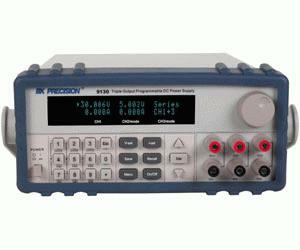 The 9130 is ideally suited for applications in Electronic Test, Production and Service, where multiple independent DC supplies are required and bench space is at a premium.